JV-LinkDirectory - What is an Adspec and How to add one? What is an Ad Spec? Adspec defines the specification for an advertisement. Each adspec has a unique code that you must insert into one or more JV-LD templates using Style Manager. This also means that you can have the advertisement in different kinds of pages, by pasting the unique code in those pages. In other words, each Adspec defines one or more ad slots, where advertisements can be placed. An Adspec consists of a title, description, unique code, specifications for banner ad and text ad or both. You can also define the maximum number of impressions for an ad spec. Impressions are also called Views. By default, the advertisement will be displayed till its expiration date or if the maximum number of impressions for it is reached, whichever occurs earlier. 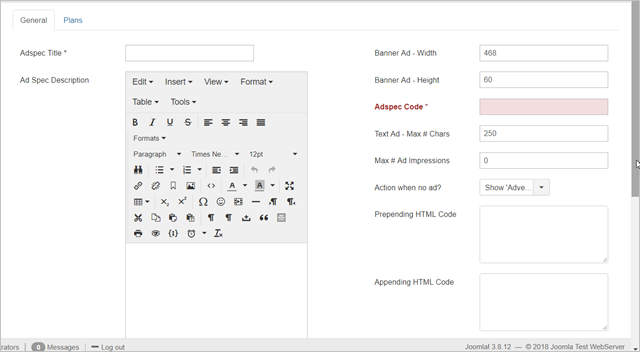 You can set the maximum number of impressions for ad of this specification, using this field. A customer will be able to place his/her advertisement in a specific/purchased ad spec. JV-LD allows your customer to place text based ad or banner based ad. You can control the selection and more details by defining the required specification. Your specification must allow banner or text ad or both. You can also define what you want to show when there is no advertisement for an adspec. Most importantly, you can create an adspec completely to place a non-free ad as well like your own HTML. Similarly, for a paid ad, you can define unlimited pricing plans. How to add an Adspec? For adding an ad, you need to create an ad specification first and insert the ad code (of the added spec) into desired placed in JV-LD templates using JV-LD layout manager. Subsequently, you can add an ad for that spec. You can also earn money by defining a fee for advertising in your ad spec. JV-LD allows you to add text or banner ad or both types as well! Provide a title for the adspec. Provide the maximum dimensions of the banner width and height that you want to allow for the ad that can be placed in this adspec. Each adspec has a unique code that needs to be added to JV-LD template files using the layout manager. Action when no ad? - You can decide here what you want to show in the adspec space in site front-end when there is no advertisement for an adspec. Click on the "Plans" tab and add your pricing plans. All these pricing plans will be shown to the visitor when they decide to advertise in this adspec. The visitor can choose one of the plans and proceed. To provide a decimal value for price, always have atleast one digit before the decimal point. For example for 99 cents, please enter the value 0.99 . For 9 dollars and 95 cents, please enter 9.95.